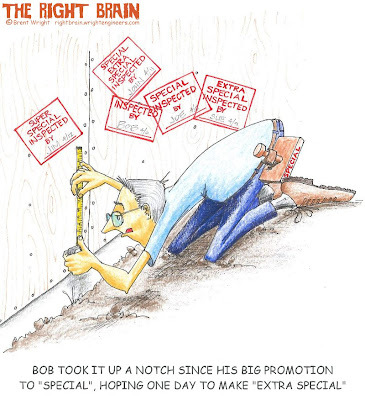 This was inspired by what felt at the time like excessive inspection requirements being proposed for wood-framed construction. It was accompanied by an article questioning the need for a "special" inspector instead of just making sure the "regular" inspector inspected properly. I envisioned a time in the future when there would be "super special" and "extra special" inspectors all inspecting and re-inspecting the same thing.